Algerian police fired tear gas in an attempt to disperse crowds on Friday after protesters calling for the resignation of President Abdel Aziz Bouteflika hurled stones at them. Thousands are gathering for the sixth successive Friday of mass anti-government protests. On Friday, riot police used tear gas and water cannon to disperse crowds in the centre of the capital Algiers, Reuters news agency reports. The renewed calls for regime change come just days after Lt Gen Ahmed Gaed Salah demanded that Mr Bouteflika be declared unfit to rule. In response to the demonstrations, the president later agreed not to stand for a fifth term in upcoming elections, which have been delayed. 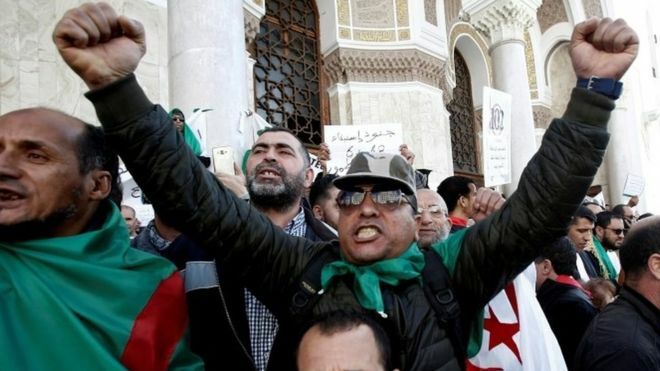 Protesters called this a cynical move to prolong his two-decade rule and are now calling for the departure of not just the president, but also an entire generation of Algerian political leaders, including those who would be in line to succeed him. Lt Gen Gaed Salah - who is also deputy defence minister and seen as loyal to Mr Bouteflika - this week called for the use of Article 102, which allows the Constitutional Council to declare the position of president vacant if the leader is unfit to rule. The ruling party, the National Liberation Front (FLN), backed the general's call. The majority of protesters are youth who are not involved in party politics and who say they are not interested in the departure of Mr Bouteflika only to see the power transferred to his former allies - bringing to power different faces of the same regime. For the moment, the protesters' expectations are very high as they demand the departure of "everybody who has been associated with the regime", but they do not offer an alternative. Lt Gen Gaid Salah had already dismissed the idea of "removing everybody" as expressed in the protests and on social media.